Neymar limps out of training…. Paris St-Germain’s Neymar had surgery on a broken metatarsal in his right foot in February, causing him to miss the rest of the season. He returned for Brazil’s penultimate World Cup warm-up game against Croatia in Liverpool on 3 June, capping his substitute performance with a stunning solo goal. He scored again in their final friendly – a 3-0 win over Austria – before Tite’s squad left for Russia. 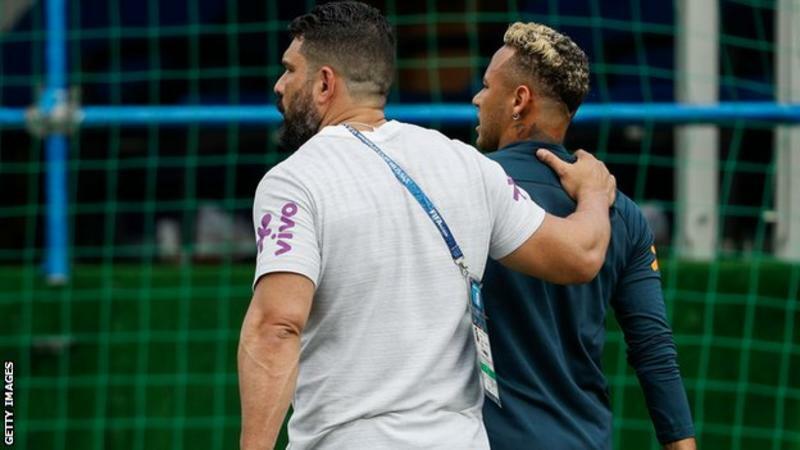 Neymar played 90 minutes of Brazil’s Group E draw with Switzerland, but did not take part in training on Monday at their base in Sochi. Brazil face Costa Rica in St Petersburg 1pm on Friday. Neymar’s 2014 World Cup campaign was ended by a fractured back in the quarter-final win over Colombia. ← FIFA World Cup Results (20 June 2018)….